Athens - Named for its patron deity, Pallas Athena, Athens is perhaps the most influential city in the history of Western civilization. So old that it's origin is shrouded in myth. According to legend, it was founded by the mythical king, Cecrops, in the middle of the 16th century B.C.. It took its name as the result of a contest between the two gods, Athena and Poseidon. Both wanted to be protector of the city, so they each struck the ground to see what would come forth. Poseidon struck a rock and a spring of water gushed forth, signifying that the city would become a great sea power. Athena struck the earth and an olive tree sprouted up, signifying peace and prosperity for the city. Cecrops chose Athena's gift and the city was named Athens (one has to wonder if the king made a deal with Poseidon anyway considering Athens became a great sea power as well). For the next millennium, Athens was essentially just another city-state in Greece. 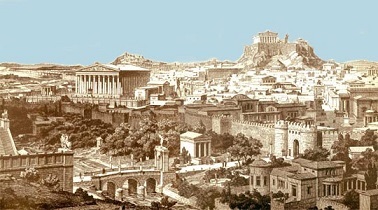 However, in the 6th century the city took the radical step of allowing its people to rule themselves and after the Persian Wars, Athens flourished in almost every conceivable field. Science, politics, art, philosophy, architecture; a wealth of knowledge was produced unlike any seen in the ancient world. Of course, events at the end of the 5th century brought it all to an unmerciful end and one has to wonder if Athena reneged on her pledge.